It was a lazy March break day and like always I was browsing Pinterest and this Texas cowboy cookie recipe caught my attention. The idea of baking a jumbo cookie really fascinated me. I’m pretty sure that you would have all guessed by the name “Texas” it implies that the cookies are huge, even though the history behind the “cowboy cookies” is unclear. I have baked big batch multigrain cookies and big batch brownies but haven’t baked anything jumbo so far. I have always wanted to bake jumbo muffins, maybe that’s next. While checking out the recipe, the ingredients which went in these cowboy cookies also made it even more exciting to try it. It had oats, cornflakes, pecans, peanut butter chips and chocolate chips. I always like improvising a recipe and for this recipe I got the idea to use up the unsweetened coconut flakes I had at hand because at home we all loved the oatmeal coconut cookies I had baked few years ago. 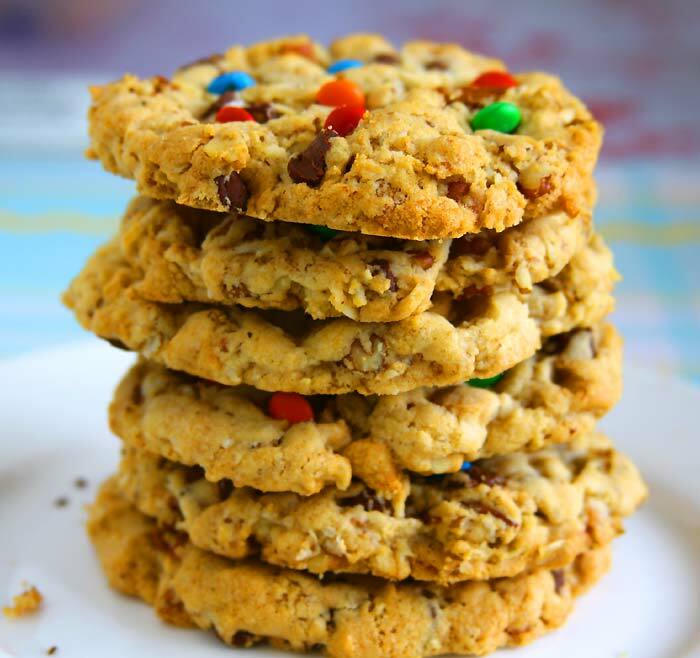 Also remembered using M&Ms in these chewy oatmeal M&M cookies. So decided to incorporate that too. But instead of mixing in the M&Ms in the batter I wanted to give all these cowboy cookies an uniform look and got the idea of pushing it down on the cookies when the cookies are warm and out of the oven like I did with chocolate chips in this red velvet chocolate chip cookie recipe. I also use All Bran bran flakes instead of the cornflakes used in the original recipe. I have substituted two eggs in this cowboy cookies recipe with Ener-G egg replacer because I personally feel that it’s the best substitute for eggs in cookies like this. Like expected these cowboy cookies without eggs turned out extremely well with a great texture and of course tasted delicious. How to make Texas Cowboy Cookies? 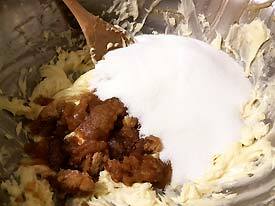 Add brown and white sugar. Beat egg-replacer and vanilla extract. Seive APF, baking powder & soda on to wet mix. 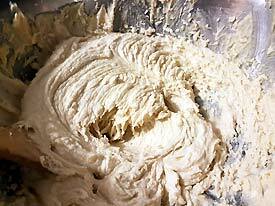 Put the dough into fridge for 1-hour. Scoop and flatten the dough and bake. Stud M&Ms once out of the oven. 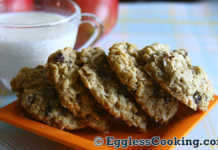 The crunchiness from the bran flakes and toasted pecans made these eggless cowboy cookies extra special. So don’t skip toasting pecans. And of course the mix of semi-sweet chocolate chips, peanut butter chips and M&Ms made it decadent. You may choose to add other add-ons or substitutes keeping the measurements same without affecting the outcome. 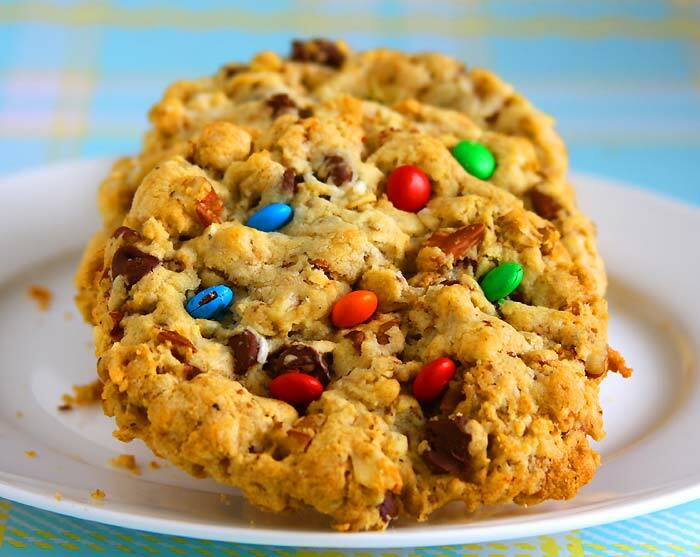 Do you want to wow your kids with a jumbo size cookie? 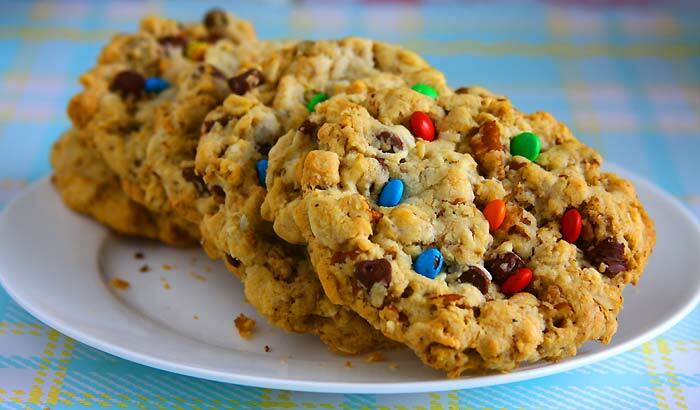 Then this Texas cowboy cookie recipe is the best one to try. With loads of add-on ingredients this is one decadent cookie that your kids will keep asking for. 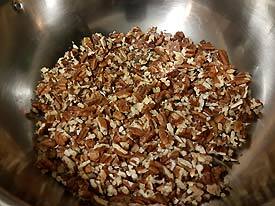 Toast the chopped pecans in a dry skillet over stove top for 3-5 minutes, until it’s fragrant. 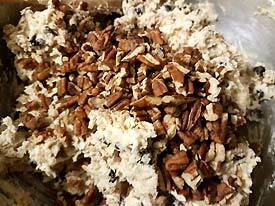 Be sure to keep stirring the pecans with a spatula otherwise it will burn quickly. Then set it aside. 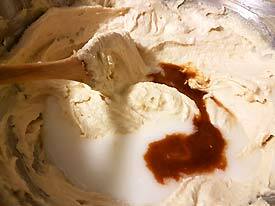 In a small blender or using a whisk, beat together the Ener-G egg replacer and water; keep it aside. 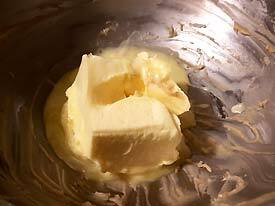 In a large bowl cream the butter until it’s light and fluffy. Add both the sugars and beat well. Scrape down the sides. Now stir in the Ener-G mixture and vanilla extract and beat further. 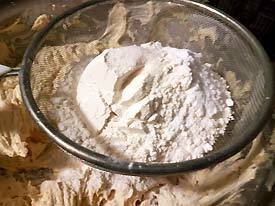 Place a sieve (or meshed colander) over the bowl and add the flour, baking powder, baking soda and salt and sieve it so that all the dry ingredients are spread evenly. Using a wooden spoon/spatula mix it all but not too much. 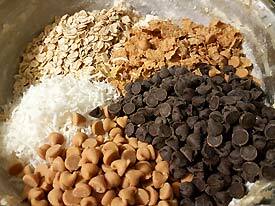 Now incorporate all the other add ons from oats to chocolate chips. Mix well. 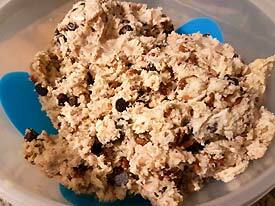 Make it into one big ball of cookie dough and store it in the refrigerator for at least an hour. 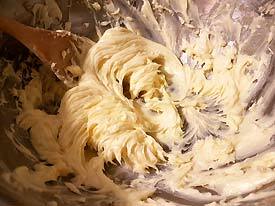 The more the dough has chilled the more it has to be on the counter at room temperature for you to be able to scoop it out. Because it’s a Texas style cookie you will have to use a 1/4 cup measurement to scoop out the dough for each cookie. Preheat the oven at 350F/180C for 15 minutes. Meanwhile scoop out the dough and place it on the cookie sheet. I test baked one cookie to see how much it spreads. I did flatten the dough lightly and the cookie spread quite a bit. So for the remaining of the cookies I flattened it even more and it spread perfectly as much as I wanted it to be. 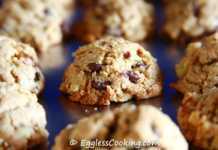 Bake the cookies for 12-15 minutes depending upon the type of the pan you are using. Remove the cookie sheet from the oven when the edges turn golden brown and place it on a cooling rack. While the cookie is still warm press in the M&Ms if using. 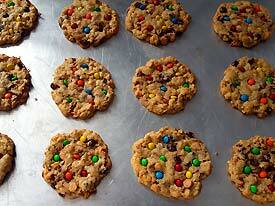 The cookie will feel undercooked but don’t worry it will harden up and while so the M&Ms will also stick to it. After about 10 minutes remove the cookies from the baking sheet and place it on the wire rack to cool completely and then store it in an airtight container. These Texas cowboy cookies have a crispy texture around the edges and a soft center. The texture remains the same for about a week if stored properly. 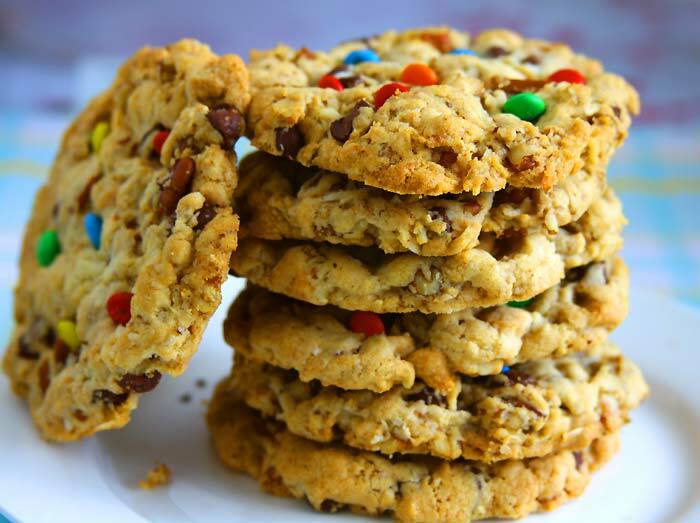 This no egg cowboy cookie recipe can also be made gluten free if you use a gluten-free all-purpose baking mix. 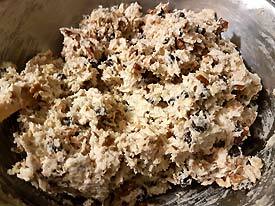 I wouldn’t add dried fruit like raisins or dried cranberries in this recipe because it will add to the moisture and make the cookies softer. It’s your personal choice. You can make it nut free by omitting it or adding toasted sunflower or pumpkin seeds instead to get the crunch. 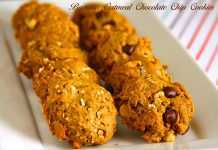 To make this cowboy cookies recipe vegan use a vegan alternative for butter and vegan chocolate chips. 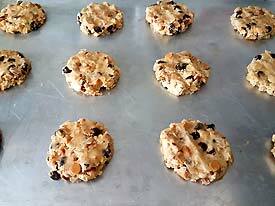 If you want smaller size cookies, use about a tablespoon of dough for each cookie instead of 1/4 cup of dough. Madhuram, I tried this recipe today and followed to the T – it came out very well. My husband and kids loved these cookies. Thanks and keep rocking with more recipes! You’re very welcome, Melissa. Thank you very much for trying the recipe and for the feedback.